Episode 1 = amazing! Episode 2 -5 = Horrendous. Wow where to begin. The first episode was perfect as a pilot episode. It showed all the characters, enough to make you curious. The plot was shown with no mishaps or confusion. And there was comedy in between. Great. I was really looking forward to episode 2. Not only did they have a filler, they did the ultimate taboo of bad fillers. The "Lets do an errand for the ENTIRE episode" filler. Not only did it give no insight in to the characters than we already knew or could presume already, it was boring, slow, and very much pointless to the entire plot. I was sad but I still wanted to give the show a good try. And then I watched episode 3. ARE YOU SERIOUS!? They take care of children? Its like they fired the writers of episode one and got completely new ones. The last straw for me was Nova's weird problem through out the episode about caring about the children. It wasn't even a problem, he just complained about a dilemma that didn't even exist or if it did it wasn't explained well AT ALL. I was even more pissed than before but I still held out. Episode 4 and 5 did a little bit better but that doesnt mean they were enjoyable. It was more like instead of 0 minutes of fun and 24 minutes of pointless babble and overused jokes they were 3 minutes of fun and 21 minutes of pointless babble and overused jokes. I have never read the manga but it has got to be better than this. I feel bad for the people who read and was expecting a fantastic adaptation and instead got THIS. One of the worst shows i have ever watched. Coming from a viewer that has played both Arcana Famiglia games, I had a high expectation for this anime, but at the same time I prepared a cushion for myself so if the anime fall short of the game (which happens often for adaptations) I wouldn't be so thoroughly disappointed. After watching the first episode, I can finally throw the cushion away and thoroughly enjoy this amazing show. Many people commented that AF reminds them a lot of Katekyo Hitman Reborn. It's hard to hide that fact that AF seemed to jumped in the KHR bandwagon, especially since the first AF game came out when KHR was at the peak of their popularity. However, AF stayed true to their shoujo/otome game root and focused more on the heroine relationship with the eligible bachelors instead of focusing on battles the way KHR is directed. Also, instead of the 'weakling turned powerful' plot focus, AF focus more towards Felicita struggles in strengthening her power (the Lovers arcana grow with her relationship with other people) in order to save the family and her father. I think it's important to point out again, that Arcana Famiglia is an anime based on otome game, just like Hakuouki, Uta no Prince-sama, and La Corda d'Oro. Thus the focus is not the action. If you go in this anime thinking that this is some sort of Katekyo Hitman or Naruto, you're going to be disappointed. There are action scenes, and it's done really well, but it's not the main focus so there's not going to be a lot. The target audience for the game and the anime is about the same target audience for shoujo and josei manga who also likes shounen. Arcana Famiglia takes place in a small trade island called Regalo (or Legaro in the latest AF game sequel) about a mafia family (the namesake Arcana Famiglia) that works like a self-sustaining government. The family is divided into departments called Serie, each serie is named after the tarot minor arcana, and each serie is lead by an executive that bears the major arcana. The major arcanas all bear a special power in return for a 'price' that's different for each arcana. 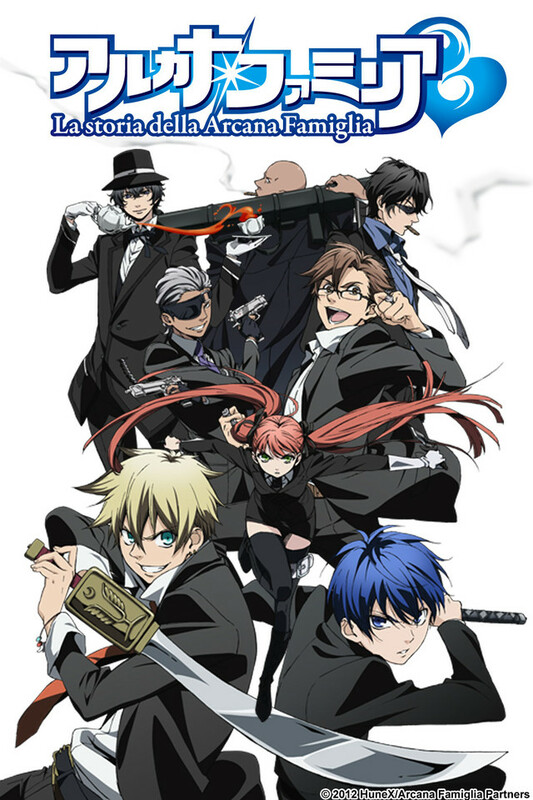 Arcana Famiglia anime has the burden of matching with the massive success and popularity of the original game. The game is directed very nicely, with a beautifully stylized art and action direction. The story for each character is well written and nicely personified. I'm excited to see how they will adapt each route's particular story to the anime, although with only 12 episodes I'm keeping my expectations low. In the first episode, I'm relieved to say that the actions and animation are done very well. The seiyuus are doing a really good job even though at first I thought Noto Mamiko's voice is too delicate for the strong and fierce Felicita. The episode is a little bit rushed to introduce all the characters and their arcana, but each snippet works to highlight a special feature and traits of that person (for example, Pace and his undying love for Lasagna, Dante and his old man puns and gag, Debito and his womanizing comments). I thought the way they did the Cocoaru (Fel's power to read hearts) was pretty good. The comedy is also done well and not too over the top. The game illustrator Sarachi Yomi (Steins;Gate) gave a shonen manga vibe to an otome game which was a very genius move to expand to both niche market and mainstream otome and shonen manga fans. The story seems to follow a little bit of each routes but I think the main route is Liberta's and the main plot will follow the Famiglia ending. Overall I have a very high expectation for AF and so far I love what I see. I'm looking forward to more of it. Normally I would never review a show after two episodes. It's not enough time to give the writers a chance to flesh out the plot or characters. Yet this anime is an easy exception. Where I watched what is supposed to be a mafia-style family with supernatural powers spend the entire day running around trying to find the owner of a lost kitty cat. Unbelievable. Second episode and no character development, no plot progression, no action, just some light comedy and a freakin' lost cat. Why even bother with the super powers and the Sicilian mob setting if you're going to do what every other slice-of-life anime has done before. So, with the second episode feeling like something that should have been filler between two seasons. I can safely say that unless you are easily amused by the simplest, most average of entertainment offerings, there's better anime to spend your time on this summer. It had serious potential, with the characters and the plot, I was excited after watching the first episode, but by thirty seconds into the second, I was disgusted and it only got worse with each episode thereafter. By the end it was flat out dull. Total anime fail. The idea was perfect to have these different groups with powers try to compete and have a tournament. We didn't get a good tournament after it was hyped up the entire season. This anime, I feel, was misleading and disappointing. I would not recommend it to anyone. Potentially good anime turned terribly rushed and had a horrible ending. Up until episode 12 I had lots of fun watching this anime. Sure, it could've been nice for it to have more action and less talk, but it was a nice thing to watch for 20mins every weekend alongside some other anime. The characters are well designed and I was getting into it more and more as the anime progressed, it was nice knowing more about the characters backstories and such. However - it was terribly, terribly rushed now that I look back on it. There were many plotholes in the anime that were never explained and the final episode was the most rushed episode I have ever seen - it really was a disappointment in my eyes. The anime halfway through seemed so relaxed and lighthearted, all for the 'main storyline' to be rushed in.. 20 minutes. The characters were made massive backstories yet the anime only had 12 episodes so were never finished. Many useless characters that had no real purpose were introduced and never looked back on. Some characters did thing that were completely out of character and made me ponder what the character actually was. Saying that, it was an okey anime to watch and if you're not too hellbent on storyline and in it for the graphics and cuties, then I recommend this anime to you. If you're looking for story however, well.. maybe you should reconsider as this anime will only give you a headache. It's an okey anime to watch on the side but don't expect anything amazing because you'll just end up disappointed. Hard to tell where this series will go, but the first episode makes it look like an average reverse-harem series. Everything here is fairly average and not-special. We have the bevvy of one dimensional young guys, all equipped with weapons and special powers. They must protect an island that resembles Sicily. There is only one girl, and she seems to dislike all the guys (seems to.....). And instead of the series being about the Famiglia protecting the island, it's about a competition to become the head of the Famiglia, get their one true wish, and get the girl's hand in marriage. Of course, she doesn't want to (sure....). Yep, pretty average. It's saved by decent, though not fantastic, animation and an eclectic, if one dimensional cast. There is also promise of decent action and possible growth, though I wouldn't bet any money on that.